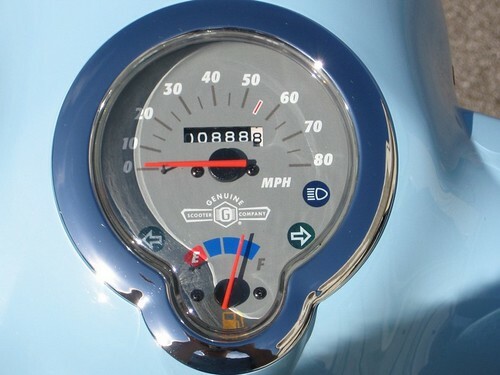 Well, I've seen various threads on this, but nothing devoted entirely to neat odometer readings. I pulled into a parking lot on my way home from work today and did a lap around it, so that I could take this photo. Sorry for the poor quality, but it was on my cell phone! Any other neat odo readings out there? You gotta be freakin' kidding me!!!!! My odometer just turned the exact same mileage this morning!!! 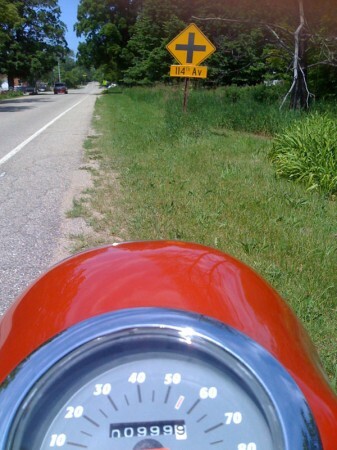 I considered stopping to take a pic but I was having too much fun riding!!!!
. ::I know the voices in my head aren't real, but man do they come up with some great ideas::. This isn't my Buddy (obviously), it's a 2003 VW I had a couple of years ago. I couldn't resist pulling over and snapping a pic. WOW!! Is this a recent pic? 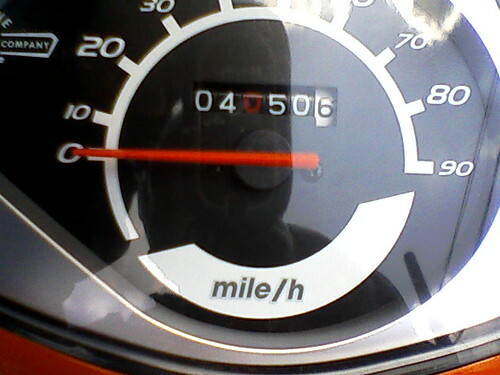 666 miles on a 2006 Buddy??? 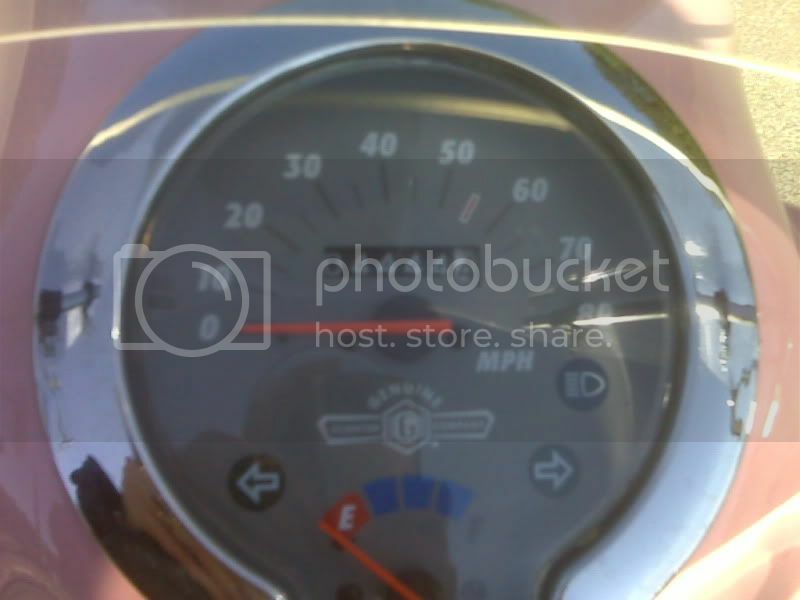 Posted: Fri May 22, 2009 5:57 pm Post subject: Check out this date & time !! Watch this one : On July 8th 2009 @ 5 minutes & 6 seconds after 4 A.M. The Time and date will be:04:05:06 07/08/09 It will never be this time and date again !!!!! Posted: Fri May 22, 2009 7:23 pm Post subject: Re: Check out this date & time !! That's true of any time and date. WOW!!! That's a winner! 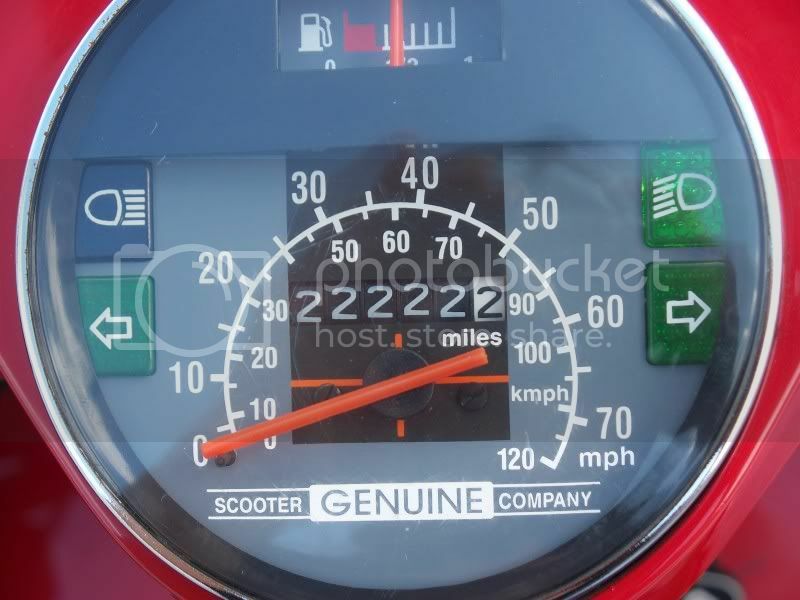 22,222.2 on your 2002 Stella, I presume? Great pic. A few weeks ago, I took a mental note when "54-46 was my number." Because of this topic, I wish I would have pulled over and taken a picture. 2008 Tangerine Buddy 125 "Scootle"
Me too. Not that exact number, but I just went past 4000 and it's something like 4026 right now. Posted: Thu May 28, 2009 6:09 pm Post subject: Re: Check out this date & time !! Wouldn't August 7th be 08/07/09? Other than North America and Japan, dates are usually expressed as (for example) 28 May 2009, and abbreviated 28.05.09. It's a more logical order... though the Japanese method of expressing it as 2009.05.28 makes the most sense, putting the most significant digits first (like with plain old numbers). 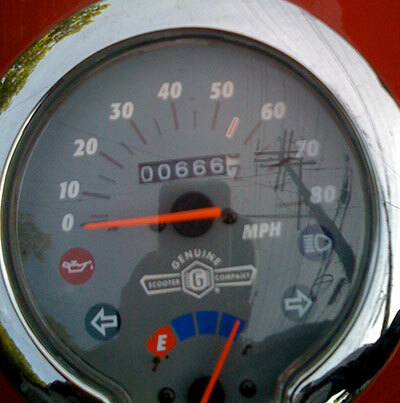 Not just 666, but 666.666 miles! Wait, so your car only has 42 miles on it??? Wow... I was playing the nerd card before, but a binary "answer to life, the universe and everything"... you win. You totally and completely win. I missed that when I saw it. Bravo! You're my new geek hero. Wonder if that reading was from a Ford Prefect?? nice one, i'll listen to that starting....................now. There are 10 kinds of people in the world. Those who know binary and those who don't. 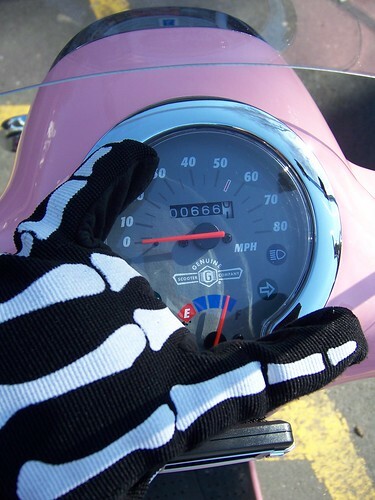 We need to get Bonegirl to post her 30,000 here. Seriously, I think she's got the most currently. Alix had what? 24k? I'm almost at 18k, anyone else have a real high odo? Wish I was in Vegas when those three 7's showed up! Especially considering this is a "Blackjack" . I reached a milestone over the weekend: one thousand miles. It seems like only a couple months ago this thing was brand new! TVB, Looks like your miles go by in a "Flash". I live in Denver - The Mile High City - so I've been waiting for this one. 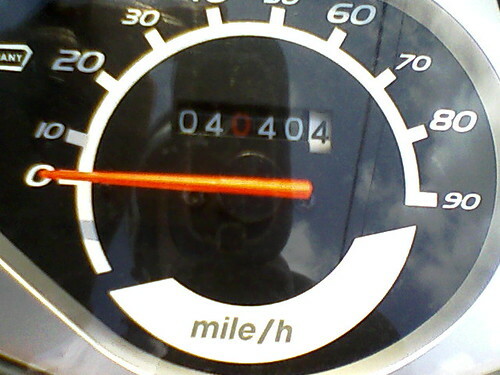 Ha, yesterday I drove right through 4444.4. I will try for 4567.8. I feel your pain, gr8dog! I forgot to stop & shoot 7777.7, d'oh. 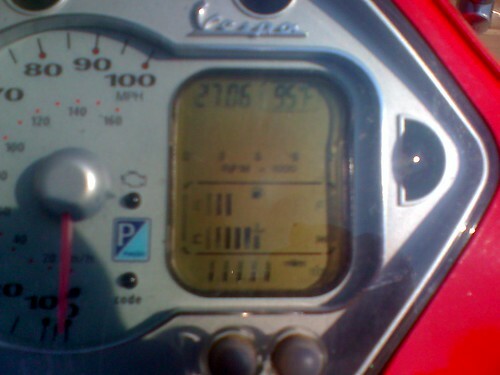 well, 11,111 miles should be on the GTS by the end of the week. I will post it! By the end of the week right? Awwwww....you shoulda gone another .9 mile further and then taken the pic!!! This one is an oldie, seemed exciting at the time; plus I like 8s. Finally mastered the image posting w/ Flickr..Who hoo! Here's mine... not nearly as high as some of you though! Any other internationals at 10k? 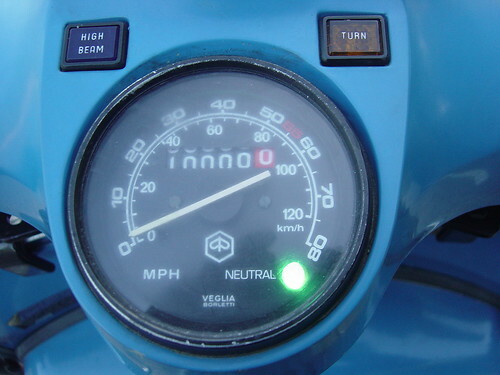 My Vespa just hit 10k! Maybe if I stuck to one ride, my St Tropez would be there like Howardr! 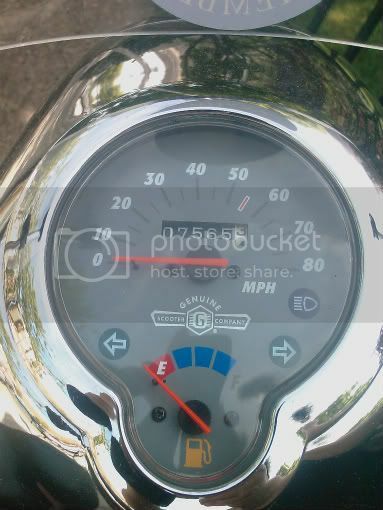 This is a big deal as this is a resurrected P that hadn't been ridden in 15 years and had hardly anything done to it. The P is the Volvo 240 of the scooter world. I'm gonna try to get 5446 on the StT.